Double bill of action/adventure. 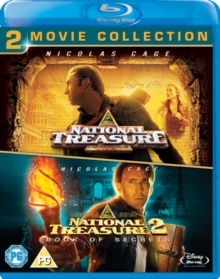 In 'National Treasure' (2004), Nicolas Cage stars as Benjamin Franklin Gates, an archaeologist from the seventh generation of a family of treasure-seekers who have all shared the same quest: to discover the whereabouts of an old war chest full of gold hidden by the founding fathers in the last days of the Revolutionary War. Ben must work against the clock to unravel the clues embedded in the original drafts of two key historical documents - the Constitution and the Declaration of Independence - before his criminal ex-partner Ian Howe (Sean Bean), or the FBI - led by Agent Sadusky (Harvey Keitel) - get their mitts on the loot. Helping him in his quest is beautiful archivist Abigail Chase (Diane Kruger). In 'National Treasure 2 - Book of Secrets' (2008), Nicolas Cage reprises his role as artefact hunter and archaeologist, Ben Franklin Gates. When a missing page from the diary of Abraham Lincoln's assassin, John Wilkes Booth, surfaces, one of Ben's ancestors is implicated as a conspirator in the murder. In an attempt to clear their family's name, Ben and his father, Mitch (Jon Voight), travel the globe in search of the other missing pages from Booth's diary. The journey leads Ben and his crew not only to surprising revelations, but to the trail of the world's most treasured secrets.